I have tons of pictures from my pregnancy scattered throughout my blog, and I'd planned to just grab those for this link up. But for some reason they aren't loading right. And I've ghosted my computer since then and can't find the saved files with my old pregnancy pictures. 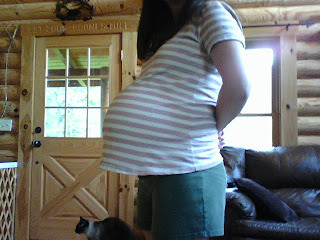 But it's not all a complete loss - I found this one from when I was 37 weeks pregnant with the twins (I went to 38 weeks, 4 days - Reid weighed 6 lbs. 14 ounces and Cort weighed 5 lbs. 12 ounces - in case you're curious). I don't have any preggo pics showing my face after the halfway point, because my face tends to get really fat like the Marshmallow Man from Ghostbusters swollen during pregnancy. My stomach was so huge I only had about 2 shirts left that I could wear at this point. Whew, glad not to be this size anymore! I have a great giveaway right now for eco-friendly green products from Shaklee - you can go enter HERE! That was a heck of a bump! Wow! That quite a bump. The boys sound like they came full size. What a bundle of love! I got like that at the end of mine, too- only having a shirt or two that still fit me! I wish I'd had more pics of just my bump, like you did! So cute! That's some belly! I have almost NO photos of me pregnant. Probably a good thing. I blew up like a blimp. Well that just makes my back hurt. tee hee... Carrying around two little people at once I bet would. :O). oy!!! that's all i can say! Wow! That's amazing. It's always incredible to see moms of twins. Gorgeous! That was some baby bump, amazing! I would have collapsed under the weight :) You did rock it! I was just thinking about this...and was wondering how I ever could breathe! I cannot imagine twins!!! I love pregnant belly pics! I seriously think even at 37 weeks the absolute only thing big on you was your belly. there's definitely a baby in there. I only gained 19 pounds with Amy, but I was surprised at how big my stomach got right before she was born. I was happy, because no one could tell I was even pregnant. I remember that Stuart wanted to try the beer at a local brewery, and the server asked me what kind of beer I wanted. I said I was pregnant (seven and a half months, at that!) and she was embarrassed because she couldn't tell. You rock that bump! Awesome and fun. You did have a big belly, but with twins I guess that's natural. I would like to see your face though. I bet it's not near as bad as you think! Wow glad that's not me but then how could it be. Glad you are over that, take plenty af aspirin. Then over the Hump. Oh your bump is pure adorable! PURE! That is a bump! I had two children and each weighed ten pounds. I decided no more! I cannot imagine having twins. My husband has an identical twin...and so does his mom. Oh wow, I'm so envious at how beautiful and perfect your twin belly was!!!! I went to 38 weeks too! The only reason my dr took them early was because I live an hour and a half away from the Dr. So he didnt want me to go into labor and then have to drive that far! Your bump was huge, but still cute!! My face also got a little, shall we say, puffy? during pregnancy. Your babies bump rocked girl! Notice I said babies bump! lol There were 2 in there afterall! I'm sure your face looked as adorable as your bump! No fair, Lisa! I put my fat preggo face in my pics on my Rockin the Bump post! Your belly is adorable and amazing. I only went to 34 weeks + 4 days ish w/ my twins. I'm really curious to see how this pregnancy goes and what size this baby will be? I have no idea what to expect! !